A primary reef-building coral, the Staghorn Coral holds the most important job in the Western Atlantic reefs! Although the Acropora genus has close to 400 nominal species, only three are found in the Atlantic Ocean. The Staghorn Coral Acropora cervicornis is one of these. They are dominant, of the two species of Caribbean Acroporas. The Staghorn Coral offers a variance on shape and structure in the Acropora genus. With branches that are more loosely spaced, they have a more "laid back" look to them. This is a big plus with Acros because they need that good water flow between their branches to stay healthy. This in turn makes it easier to care for, with less worry about debris build up. Being a primary reef building hard coral, the Staghorn Coral has a lot of work to do. They are currently listed as critically endangered as there has been a population reduction exceeding 80% over the past 30 years. This is due mostly to the effects of disease, but climate change and human-related factors are also suggested. The current populations today appear stable, and reefs are being rebuilt. But the progress is slowed by increased populations of urchins and other creatures that hinder growth. The A. cervicornis have been propagated in captivity, thus helping to spare the wild populations in the Atlantic reefs. It is illegal to harvest corals for commercial purposes In US waters. Buying captive propagated A. cervicornis also helps the aquarist, since they are a little more hardy than their wild siblings, but they can still succumb to diseases typical to Acros. Distribution / Background Acropora Coral Information: The Staghorn Coral Acropora cervicornis was described by Lamarck in 1816. They are the primary reef builder in the Caribbean. They are the dominant Acro of the two species found in the Caribbean. The less dominant species is Acropora palmata. Since El Nino in 1982-1983, their population has been slow getting reestablished. Where Acropora Corals Are Found: A. cervicornis are found in the Western Atlantic ocean, specifically, the Caribbean, Bahamas, Florida Keys, and Venezuela. Acropora Coral Habitat: The A. cervicornis are found at depths between 0 - 98 feet (0 - 30 m). They prefer warmer water and will not do well in water under 68° F (20° C). Status The Acropora cervicornis is on the IUCN Red List for Endangered Species as Critically Endangered (CR). Description What do Acropora Corals look like: All Acropora Spp. corals have very porous and lightweight skeletons. The A. cervicornis grows in a branching formation where branchlets "Y" off at right angles. It is not compact like A. prolifera, but loose and open, in an almost relaxed state. Their basal (bottom) parts are usually dead. Their bases are very dense. Acropora cervicornis along with the Staghorn Acroporal Acropora formosa, has the densest base skeletons ever recorded in stony corals. Their round cylinder shaped branches can reach from 3 feet (1 m) up to 6 feet (2 m), but only under ideal conditions. At night, they send out their tentacles and increase their girth by taking in water. Acropora cervicornis comes in colors of yellow, brown or gold. Acroporas with thick branches are said to be harder to keep than ones with thin branches. Also brown Acros are said to do better than the colored variety. Acropora Coral Life Cycles: The Staghorn Coral A. cervicornis can grow up to 6 feet (2 m) in ideal conditions. It reaches sexual maturity within 3 to 5 years, with a branch diameter of 1.5-2.75" (4-7 cm). They can live 4 to 7 years. Acropora need to be carefully acclimated to their new homes. They need to be placed in their permanent position within a tank after acclimation. It takes about 5 to 6 months for the A. cervicornis to regain their normal growth rates after being added to an aquarium. Moving Acropora from place to place will stress them, and possibly cause death. At times a healthy system has an additional Acro added and all the others die from polyp bail out or what people refer to as RTD (rapid tissue degeneration) and a whole tank of acros can be wiped out within a matter of hours. They are unsure why this happens, but it would probably be a good idea to have all the Acros you are going to want, and put them together at once while they are still young. A typical live rock/reef environment is what is needed for your Staghorn Coral, along with some fish for organic matter production. A mature tank (well over a year old) is advised to increase the chance of successfully keeping Acropora. Water Movement: Moderate and surge-like. They prefer a strong, random, mixing-type current, therefore a rotating powerhead or wavemaker setup is recommended. Tunze stream pumps, though they have a comparatively high initial purchase price, are popular with Acro keepers. There are many animals that will prey on Acropora spp. corals. Some Acropora have symbiotic relationships with crabs and shrimps that may help them against predators. Other hitchhikers may actually be predators so careful observation must be done. Availability Acropora Corals for Sale: The Staghorn Coral A. cervicornis are very hard to find at pet shops and on line. More than likely they will be under "Acropora sp." or "Acropora spp.". 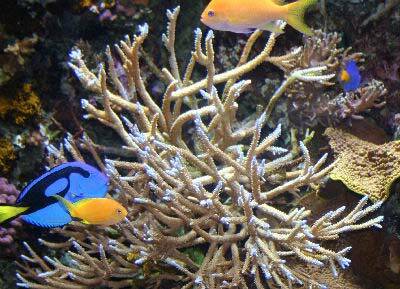 In US waters, it is illegal to harvest corals for commercial purposes, so make sure your coral is captive propagated. It's difficult to keep in a tank. only a expat can keep this type coral in the tank. Thank you for the information. Doesn't sound like an easy thing to do. Any suggestions?